This year, Scheidt & Bachmann is introducing the latest version of its ticketless in-lane passage device. 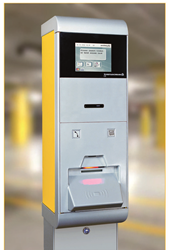 This unit allows for ticketless transactions in parking operations with RFID transponder cards, QR barcodes or credit cards. The passage device leads the way for our customers to provide a ticketless means to their operation without losing the flexibility of reservation systems, loyalty programs, contract parking and pre-booking systems. Although the device is still in product launching phase, the slick, new look for the new additions and functional improvements to the unit will surely attract the attention of many parking operators. Here is a first glimpse of the new features of the passage device. Scheidt & Bachmann’s passage device is a compact entry/exit device that controls barrier passage used in parking facilities that do not require ticket production. The device is specifically designed for applications in which no issue or disposal of media (paper tickets or ChipCoins) is required and instead has a reader that checks defined means of identification such as transponder cards, QR barcodes or credit cards of authenticity to generate access control. The passage unit allows users to operate it from within a vehicle and can be installed both indoors and outdoors. The new passage unit is the latest hardware to be introduced by Scheidt & Bachmann in 2014 and is expected to be launched to the public for purchase this year. Scheidt & Bachmann expects an increase in demand for a unit such as the passage device in the near future due to the universal operation of the unit. Please contact Scheidt & Bachmann directly for more information on the latest passage device and other hardware solutions by visiting http://www.scheidt-bachmann.com or calling (781) 262-6667. Scheidt & Bachmann international transportation solutions provider since 1872. The family-owned German company operates two of its largest divisions – Parking Systems and Fare Collections Systems – in the U.S. market from its subsidiary headquarter in Burlington, MA. The Parking Division offers parking access and revenue control systems to various industry clients including airports, hospitals, universities and municipalities. All of the software and hardware equipment are made internally at the S&B factory either in the U.S. or Germany. The company prides itself on maintaining a reputation as the top leader in the industry through its focus on innovation, reliability, flexibility and service.